Daniel Carter is one of the most important living jazz musicians on the scene. 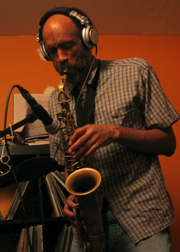 Over the past three decades-plus, Daniel Carter has performed with: Sun Ra, Billy Bang, Roger Baird, Sufjan Stevens, The Undisclosed Recipients, William Parker, Roy Campbell, Sabir Mateen, Simone Forti, Joan Miller, Thurston Moore, Nayo Takasaki, Earl Freeman, Dewey Johnson, Nami Yamamoto, Matthew Shipp, Wilber Morris, Denis Charles, MMW (Medeski, Martin, & Wood), Vernon Reid, Raphé Malik, Sam Rivers, Sunny Murray, Hamiet Bluiett, Cecil Taylor, David S. Ware, Karl Berger, Don Pate, Gunter Hampel, Alan Silva, Susie Ibarra, D.J. Logic, Margaret Beals, Douglas Elliot, Butch Morris, Biet Indecisive, TEST, OTHER DIMENSIONS IN MUSIC, ONE WORLD ENSEMBLE, SATURNALIA STRING TRIO, LEVITATION UNIT, WET PAINT, THE TRANSCENDENTALISTS, and many many many many others.